Last year, I wrote an article about how to enjoy Halloween with a baby Neopet without scaring them senseless... but, like many owners of baby Neopets, I have since endured a year of tantrums, screaming, being woken up in the middle of the night, having baby food flung in my hair, scribbling on the walls of my Neohome... and it's time for some payback! Want to join me? Well, here, my fellow frazzled baby owners, is a guide to show you how to do it, too! 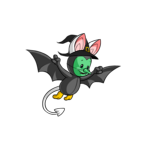 Now, before anyone gets angry and starts condemning me as the world's worst Neopet owner, let me first remind you all that being scared witless is what Halloween is all about! It's exciting to get scared, and as long as we're all there for calming cuddles at the end of it all, it's all in good fun... possible psychological scarring aside. Step One: Perfect your maniacal laugh. Whether you go for a shrill, ear-piercing cackle or a deep, booming guffaw, if you're going to do something a little evil, you need to be able to laugh at your own twisted genius in an appropriate manner. I would recommend going to the bathroom of your Neohome (the tiling causes the noise to echo wonderfully) and practicing in front of the mirror. This will also help you get into character, so to speak, and help you get into the mindset of a true malignant miscreant. Feeling evil yet? Now it's time to abuse your position of trust and exploit your baby's deepest fears. Fear of clowns? Stock up on Chia Clown Balls and Silly Clown Usukis. Fear of Spyders? Roasted Spyder on a Stick for breakfast! Fear of thunderstorms? Time to trade for an Unexpected Lightning Strike! Whatever your baby's biggest fear is, consider ways in which you can incorporate it into your Halloween plans. And if that sounds a little too mean for you, just remember that expensive Pretty Fyora Potted Flowers your baby threw across the room and smashed. You know what they say; if you fail to plan, you plan to fail. And what's more embarrassing than failing to scare a baby? A great way to give your child the chills is to change their comforting, cheery Neohome into a house of horror. If you don't have many Neopoints to spend, you can add some Spooky Rocks to your Neogarden and hang Neohome Cobwebs around inside, just enough to give a healthy touch of the creeps. Alternatively, if you're a more affluent Neopian, you could light up their nurseries with a delightfully macabre Shadow Lantern, bring in some Meepit Chairs and Casket Bookcases, and replace all your sweet little Babaa Lamp with Spooky Skull Candles. Let the older Neopet family members get in on the toddler-terrifying fun, by dressing them up to scare your little nipper, too! From the reasonably-priced Mutant Ona Mask to the Giant Moach Costume, there are plenty of horrifying Neopoint wearables for your older Neopets to wear as they jump out at their little siblings. After having found her beloved Sparkling Usuki Lipstick smooshed into oblivion a few too many times, I found that even my dear sweet Ringlet was more than happy to don an Esophagor Mask and join in for some vile vengeance! And don't forget the various wares from the NC Mall too- in times past we've been treated to everything from Spooky Witch Makeup to a Three Headed Monster Costume. I'm sure you'll be able to find something positively toe-curling amongst the yearly Halloween offerings! If you're willing to sink a few more Neopoints into your little scamp's scare, don't forget that there are a number of phantasmal paintbrushes available, too. Wouldn't it be wickedly wonderful for your baby to find all of his siblings have been transformed into Zombies while he slept? 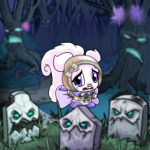 If painting one of your other Neopets is a little too expensive, you might want to consider replacing your baby's most beloved buddy with a more creepy companion. There's quite an array of ghoulish Petpet Paint Brushes available, from gruesome Mutant to spine-chilling Ghost, just the thing for transforming your baby's Petpet on Halloween. Alternatively, you could (temporarily, of course!) switch your baby's Petpet with a scary sidekick from the Spooky Petpet Shop. Just imagine... your sweet, sleepy little sprout awakening to find not their beloved Spardel, but in its place, a toothy Candy Vampire hissing in their face! NO! DON'T EXECUTE YOUR NEOPET! This is all in good mean-spirited fun, remember? After all that planning and preparation, your moment has finally come and you're ready to treat your tot to a day of terror. Don't forget that timing is important; don't blow all your spooky surprises in the first ten minutes, remember to pace yourself and build up to the big scares. Starting small with a walk around their eerily decorated Neohome and gradually building the tension through a tour of the Haunted Woods will be more effective than starting the day with having all of their zombiefied siblings bursting out of the closet shouting "BOO!" Another thing to keep in mind is ambiance; sights and smells are just as important in preserving an eerie mood as decorations are. Make sure you've not left your Blues Riff Music Track running, and a few spritzes of Eau De Esophagor can go a long way to establishing a generally vile vibe. But most importantly, don't overdo it. Oh, being scared can be fun, to be sure, but keep a close eye on your baby's reactions. Jumping, flinching and the occasional blood-curdling scream are all part of the game. But if your baby turns into a shivering, terrified wreck, you may have overdone it just a smidge. If this happens, I'd recommend taking them aside, having a reassuring cuddle, and reading a nice book together... perhaps One Scary Night or Ghost Lupe Spooky Stories. And that about wraps up our little excursion into the dark and twisted side of raising baby Neopets. Switch off the lights, turn up the Gothic Piano Spooky Soundtrack, and don't forget to use that evil laugh you've been practicing at every occasion. Say it with me, folks: MWAHAHAHAHAAAAAAAAAA!